Thank you for choosing ACC Medlink as your long distance medical transport provider. We hope we have exceeded your expectations in providing your patient or loved one with the best care during their time with us. We value your opinion and we would love to hear your feedback so we can work at becoming even better at what we do. On a scale of 1 to 5, how would you rate your experience with ACC Medlink? We want to earn your trust as we provide your loved one or patient the best care during their time with us. ACC Medlink’s transport coordinators and medical staff will assist you with every step in the medical transportation process and treat you like family. 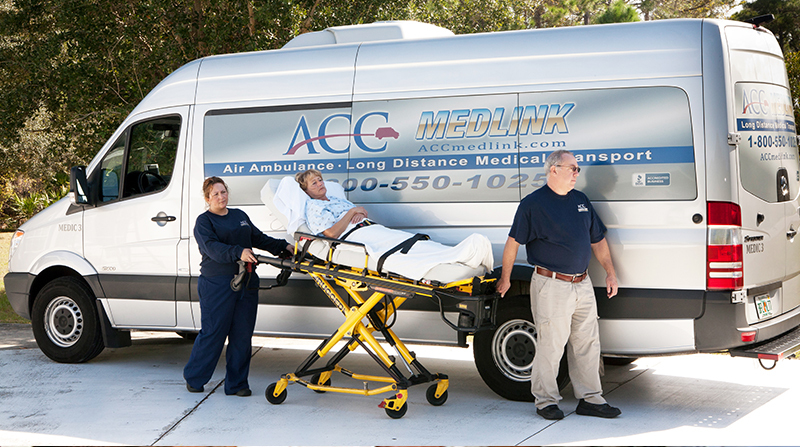 ACC Medlink has quickly become the preferred choice in long distance ground transport by accommodating special situations when medical travel is needed. We provide service 24/7 in every city & every state nationwide and always include a “personal touch”, as we like to treat each patient like our own family.